I'm a member of a cigar forum (been running for over 2 years just under 1.5k registered members) , and recently started spouting about my new found romance with DE shaving. Suddenly they all came out of the woodwork, it would seem that tons of cigar smokers are also shaving aficionados! I was wondering if the reverse was true? We've already had a few people including myself who are now both UKCF'ers and Shaving Room members. I do like empty cigar boxes though,,theyre great for keeping things in. I have the occasional cigar and when I do it's either Bolivar Belicosos or Ramon Allones Specially Selected. I did once buy a box of Siglo IIs with some 'found' money but with the smaller, thinner cigars (rolled by less experienced rollers) the quality was hit and miss. Enjoyed a nice Trinidad Fundadores(?) with a mate after a round of golf a few weeks ago. Nice but a bit over-hyped I think. Probably the best I had was a Partagas Special Edition Series D.
Mmmmm, I can see a trip to Gauntleys in the very near future. I got given 10 Cuban cigars by the FBI after working with them a few years ago, it's was something like a special 25 year anniversary set, quite funny I thought at the time, all gone now, my cigar smoking is usually saved til after I return from 6 months working abroad where I carry one then smoke it on returning. God I used to love smoking. If I joined I'd be doing it again full time and not just cigars. Me too: cigars, pipes, fags, spliffs. I could smoke all day every day. So Tony: I'll keep you away if you keep me away. Deal? As a (mostly) non smoker I fancied a cigar the other day. Decided to start small and mild, not knowing anything and found myself leaving Morrisons with a tin of Cafe Creme miniatures. Little cigarette sized things, they smelled nice in the tin, but I didn't find the smoking very satisfying really. I guess it's like trying out wet shaving with a supermarket own brand disposable and canned goop... fail! I'll say a prayer if you do, lets see who is most deserving. Now the question is did you actually love it or did you just convince yourself that you did? IME it was the thought that smoking actually helped that made me think I loved it and once I realised that 95% of the time I was just feeding an addiction which I needed to do before I could get round to the "business in hand" I was able to break the associations with pleasure, boredom, stress and an emotional crutch and ditch my "old friend". If I still thought I had loved it I would still be doing it, I smoked for the best part of 20 years in full knowledge of the health and cost aspect my dad has heart disease and my father in law emphysema none of that stopped me, it was only once I was fed up with smoking, realised that I didn't love it and wanted to stop that I managed to. Likewise while I do find the smell of a fine cigar attractive and I know (for me at least) that its a slippery slope. If I awake the old addiction to nicotine the the odd cigar after a nice meal will turn into a box of Cafe Cremes every few days and ultimately lead to 20+ ciggys a day. Been there got the t-shirt, the buzz that I got about 5% of the time i.e. one cig in each packet if I was lucky certainly aint worth the 95% of crap that came along with it. Yes its a good point, I'm sure smoking was all those things to me but I broke my habit by identifying smoking as an accompaniment to other things that I really enjoyed and that usually involved drinking a liquid...coffee,tea, pub (pre ban), using my car, and being with friends who smoked. So it was easiest for me to break all those associations and give up all those things for at least three months and go cold turkey. The only thing I haven't really reintroduced is going to pubs because even though they are now smoke free I feel they might be a trigger. Drinking and smoking go hand in hand for me. Very similar to myself , I also more or less gave up 'the drink' except for once or twice a year, rather than every night of the week ,in the morning ...you get the picture. Never seemed right not to have a drink in one hand without a fag in the other. About 10 years off the fags now. I started smoking when I was 11/12 , gave up in my 30's. At the begining of the year I had a chest infection after the swine flu that lasted for 3 months ,had the inhalers,drugs,chest x-rays and a nebuliser. Nearly feckin' killed me , probably would have If I was still smoking. Proud Yank cigar smoker reviving this thread after 6 years. 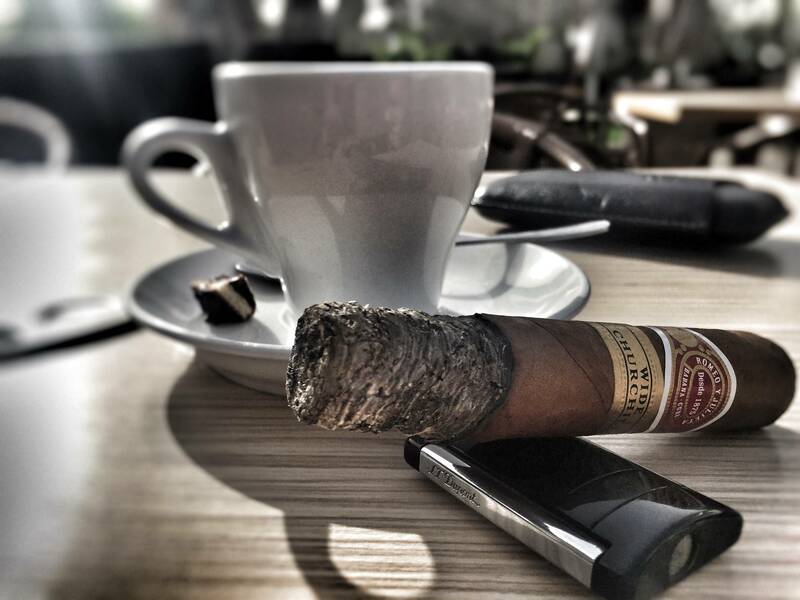 Romeo and Julieta Wide Churchill & Coffee. I'm a bit the same - I used to love a cigar back in the day, last time I had any they were some rough cheroots I got in Spain mmm! Tasty! I have now finally weaned myself off tobacco though only to replace it with vaping. The occasional Jamaican cheroot was the last thing to go. I miss it though, it's a bit like having roast beef but no gravy. Still I'm sure it will pass ... hopefully...perhaps? My favourite (price-wise) is the Romeo & Juliet #2; if price is no object (right! ), then it's the Cohiba Robusto. I, too, would smoke one every day if I had the money, and hadn't had two heart attacks. As it is, a Romeo every few months is all my doctor will tolerate. I've never smoked except that I used to enjoy the occasional cigar, I worked up from supermarket minis to Romeo and Juliet no4's, but also enjoyed the C Gars Inka Secret Blend peruvians. I stopped when my wife got pregnant and just never started again. Sometimes I visit a lovely cigar and whiskey lounge in central London, close to Leicester Square. Quite a small venue but have lots of stock. Nice place. Tried my first Diesel cigar today. Tried my first Ashton VSG torpedo. Big fan of quality tobacco in general. Snuff, Pipes and Cigars. I'm quite partial to the new world cigars, not just for price point but also they are a great smoke!